What are Folliculitis and Furuncle (Boil) ? Folliculitis is a superficial inflammation of hair follicle (hair pore) caused by bacteria. When the infection affected on hair follicle, it is called a furuncle. When the infection affects several hair follicles and the adjacent tissue, it is called a carbuncle (boil). What are the presenting features of Folliculitis ? The folliculitis usually affect the scalp, face, trunk and legs. The hair follicles are surrounded by either small pockets of pus or small red lumps. Sometimes, many adjacent hair follicles are affected at the same time giving rise to what is commonly known as boil or furuncle. In such instances, surgical drainage of the pus may have to be carried out besides antibiotic tablets. How are Folliculitis and Furuncles treated ? In mild cases, antiseptic wash and antibiotic creams can easily eradicate the problem. Antibiotics pills are needed for extensive or severe cases. What is a Carbuncle ? This is a severe and extensive inflammation of skin around the hair follicles (hair pores) and its surrounding tissues. It is caused by bacterial infection in individuals who have low immunity. It is often seen in patients with diabetes mellitus. What are the presenting features of a Carbuncle ? The carbuncle usually affects the back of the neck, limbs and trunk. 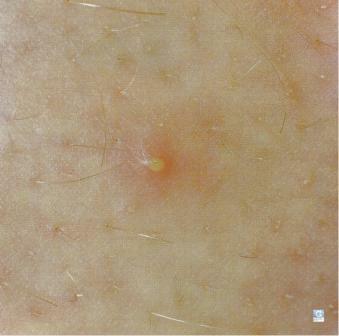 The lesion appears initially as a red painful/tender nodules around a hair follicle (appearing like a collections of furuncles). Pustule may be present on the surface. The lesions then enlarges with pockets of abscesses and ulcerate. How is Carbuncle treated ? Carbucle should be treated immediately. A Patient with a carbuncle should be hospitalized for surgery (to remove pus and dead skin tissue) to prevent the spread of infections to other parts of the body. The patient should be treated with appropriate systemic antibiotics.